We are sponsored by the Stamp Fairy who kindly gave us some images to play with. I went with pink & Brown for my dt card this time. Lovely color of pink. Very cute. Thanks for joining our star challenge at Creative Card Crew. 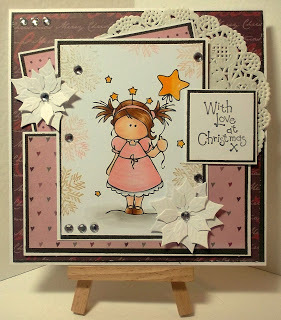 Gorgeous card Shell, I like the image the colours and the doily, Thanks for joining in with us at Sketch N Stash, Good Luck. Lovely card. Thank you for joining us at Sketch n Stash.